Website monitoring tool provides a good solution for the Webmaster and the Website owners who regularly check the status of the critical website (for uptime downtime and error checking) and measures how well a website responds to a browser request. This multithreaded web site monitoring tool easily checks the status of any HTTP, HTTPS, POP3, SMTP and FTP protocols website pages. The program is fully capable to check the behavior and availability of important Web sites, according to your needs. The software provides variety of customized alert options including (Email, alarm, runs specified program) when the given website is down or inaccessible due to any error including ‘Connection Failed’, ‘Server Not Found’, ‘Low Bandwidth’, ‘Host not Found’, ‘Low Connectivity’ etc. Using the package you can optimize the internet experience of your customers. • Monitor your multiple inaccessible web sites performance in real time. • Easily support all major HTTP, HTTPS, POP3, SMTP and FTP protocols. • Monitor number of profile at single instant. • Provides Customized alert options (by Email/beeps sound/or runs a specific program) for any down critical websites. 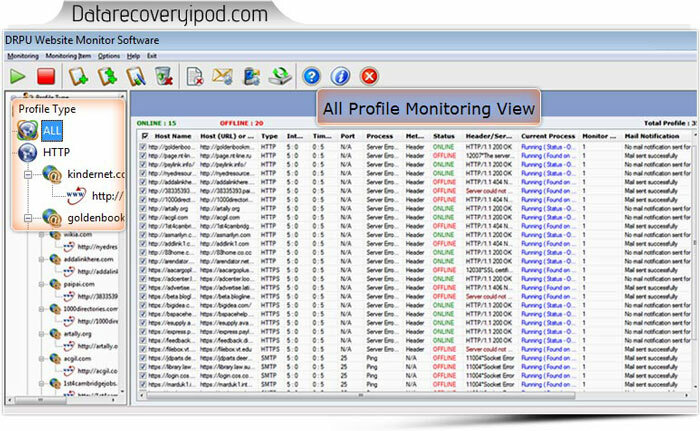 • Easy and safe to use website monitoring tool!